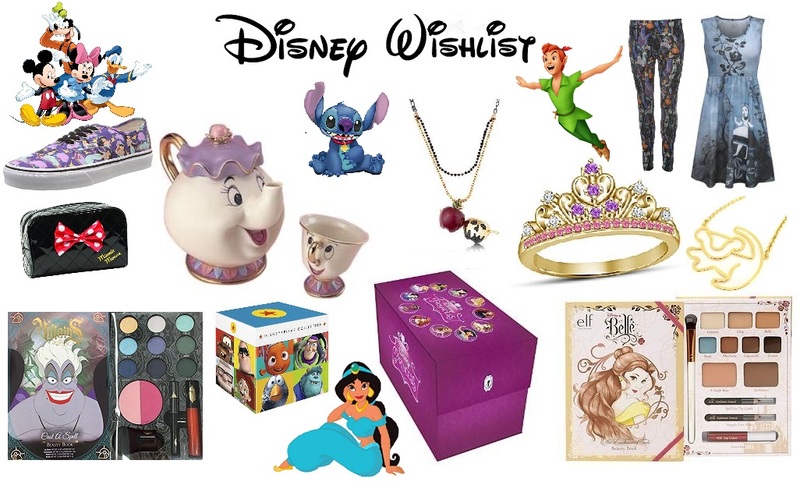 I was put to the challenge by Amazon of creating my very own Disney Wishlist. I thought this was an awesome thing to do as I love Disney so much, so obviously I wanted to join in on it. I hope you all love reading this blog post as much as I loved writing it! 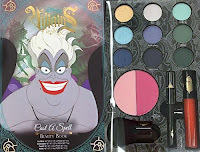 This Disney Villains Collection Ursula Beauty Book includes eye-shadows, blush, lip colour, and more. 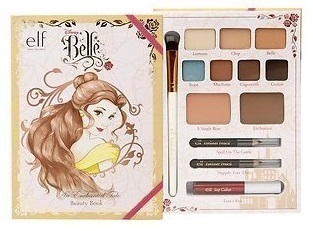 It's inspired by the Little Mermaid character, and is a limited edition item which is now rare and hard-to-find. It's imported from the USA, ready to post from the UK! What could a beauty lover ask for? I am a massive lover of The Little Mermaid anyway, it's one of my favourite movies ever made so this is obviously on my list. 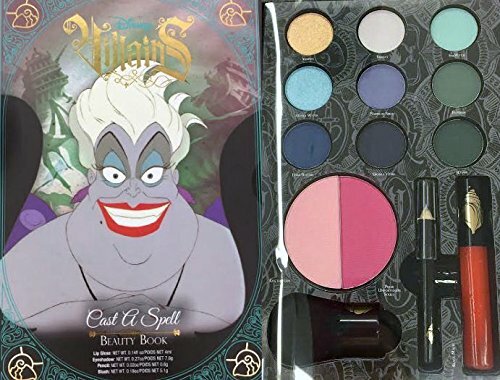 Another awesome beauty collectable which contains lip colour, blush, eye liner, and nine different eye shadow colours and also features two different make up guides. 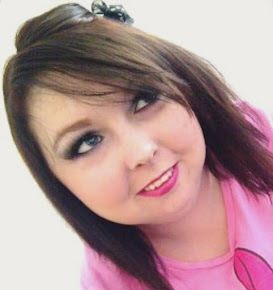 Perfect girl for any make up lover! Also I love the shades of the eye shadows. As I have blue eyes I feel like these colours would really go well together. 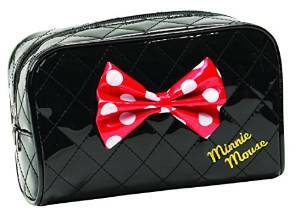 Okay, I love make up bags - I have loads of them, and I love Minnie Mouse so this seems perfect for me. This Minnie Mouse make up organiser is quilted PVC finish which is wipe-able, and featuring Minnie's iconic bow in red polka dots and a yellow Minnie Mouse text embroidery. I just love this so much. I really, really would love this. 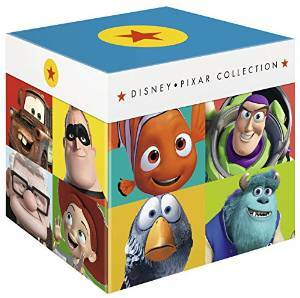 It includes all the classics such as; Toy Story 1 2 and 3, Bugs Life, Monsters, Inc. and Monsters University, Finding Nemo, Incredibles, Cars 1 and 2, Cars Toon: Mater’s Tall Tales, Ratatouille, Wall-E, Up, Brave, Monsters University, and Pixar Short Films Collection 1 and 2. 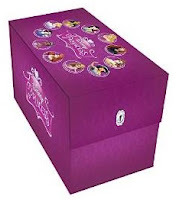 Plus a load of special features - which all comes in an awesome keep-sake box to storage them all in! 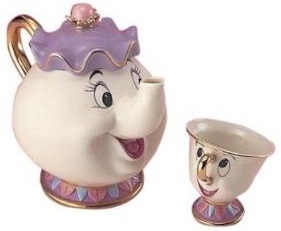 A must have for any Disney movie lover right?! Collection of eleven Disney animated films: 'The Princess and the Frog', 'Brave', 'Cinderella', 'Sleeping Beauty' 'Beauty and the Beast' 'The Little Mermaid', 'Pocahontas, Mulan, Aladdin, Tangled and Snow White and the Seven Dwarfs. Compared to the last DVD box-set and this - it would be a dream come true to own these. Price: £159.94 FREE UK delivery. How stunningly beautiful is this though? Each of the character charms are meticulously hand-crafted and plated in gleaming 24-carat gold; their bright colours faithfully capture the animation art of talented Disney artists. 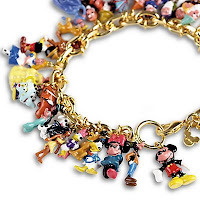 Charms include Mickey, Minnie, Tinkerbell, Snow White, Cinderella, Aurora and Belle and charms are suspended from a 24-carat gold-plated bracelet featuring an open silhouette of Mickey's famed ears that joins the characters together forever. I need this in my life. This is so classic and delicate looking, yet so beautiful. 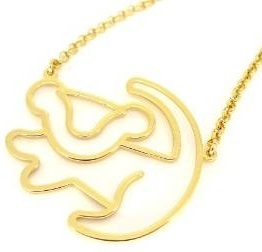 This is a Disney Couture 'Simba' necklace from the Disney movie The Lion King, this beautiful collection is perfect for anyone who is a fan of the award-winning movie or stage musical. With adorable yellow gold-plated necklace featuring a pendant with a Simba outline design. This would make such a cute little gift too. I really think this is stunning. It doesn't show it on this picture but the apple actually opens up to reveal a small diamond inside, it's just beautiful. I do think this is for more of the 'gothic girl' but I do think this would make the perfect birthday or special occasion present. Price: £23.46 FREE UK delivery. This Rapunzel Princess Crown Ring is one of the best pieces of jewellery I have ever seen in my life. It's 14K yellow gold plated, stamped with 925 it is just stunning. 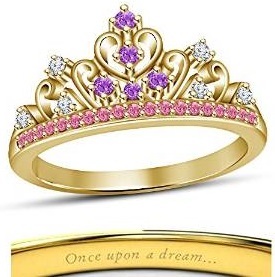 Plus with free engraving words saying "Once upon a Dream..." Who wouldn't love this? It's been on my wishlist but ages now and I will own it some day! Price: £30.00 & FREE Delivery in the UK. Okay so let's just get one thing straight - I am a Vans and a Converse lover. And these shoes are one of the best pairs I have ever seen. I don't wear heeled shoes as a lot of people know already as it really because it really hurts my RA if I even try to do so, and finding cute shoes can be a massive pain in the bum but these are awesome! I will own them one day... I hope! Price: £7.00 + £4.99 UK delivery. These leggins seem so dark and gothic, let stunningly girly at the same time. Not the most expensive thing on my wishlist but I haven't bought them yet because all of our money has been going on doing our new home up. I do like these a lot though as it's not all about the Disney princess' it's about the villains too which bring a huge part to any Disney story or movie. I think these would look beautiful with a plain top and plain flat shoes so that they can stand out. Price: £32.99 + £4.99 UK delivery. Another gothic-like dress again but I love the darker side of Alice in Wonderland. This dress is like a piece of art, and I would get lost in it's beauty all day. I feel like because I have massive boobies (size 36GG) and a smaller waist (size 12) this would really suit my figure as 'skater style' dresses normally do so. 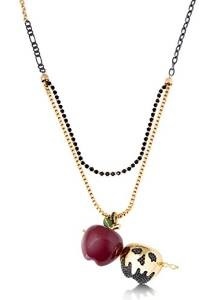 I think I am going to be buying this very soon though as it's just too pretty not to do so. Last but my all means not least, I think this is something which every Disney lover dreams of owning. Made from real Chinese pottery this is the most amazing thing in my whole Disney wishlist collection which I would want to own the most. Of course if I did own it I would never use it as it's way too beautiful to be used. I'm sure everyone agrees with me that this is beautiful? Thank you so much to Amazon for sponsoring me for this blog post, I had so much fun doing it. Please let me know if "wishlists" are something which you would like to see more of on my blog. And please let me know if you have a Disney Wishlist yourself on your blog post by sending me the link, or if you think there is anything that I may love so much that I may want to add to my Disney Wishlist. I hope you all have a wonderful day!